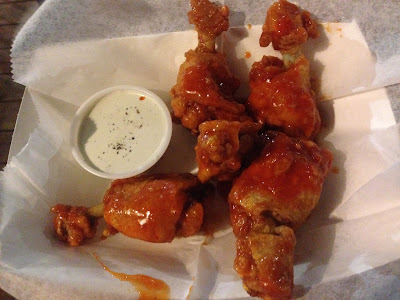 In the latest installment of my Austin Chow Guide I combined two trips into one round-up. Reason is that as you may know I was recently married in Austin this past November. So I was down there not just the week of my wedding but also for a weekend a month and half or so before as we had to do a few checkups on the venue and also taste the food for the catering gigs. As I continue to spend time in ATX I continue to love it. I'm always going to be connected having gotten married here but even if that hadn't happened I'd feel connected thru the city's love for good food. I always eat well in Austin. First things first we needed to make sure the BBQ was what we wanted for the welcoming party on Friday night. Well truth be told we knew it was what we wanted but part of the package was getting to stop in and sample some of the stuff that would be served to our many guests. I featured Freedman's a while back and I knew we were getting the goods. This lunch was about as perfect as you can make a plate of BBQ. Moist brisket, smokey ribs and fat links of Texas sausage were sure to wow. I must've had 10+ people tell me it was the best BBQ they ever ate after the party had ended. Pieous is a place that evaded me for a little bit. Located in a part of Austin that tourists rarely make it to I only knew about this place due to a tip from Twitter. It turned out to be just a 5 minute ride from our wedding venue so I was really excited to try it out. Pieous is known for two things. The first being their real deal scratch-made Neapolitan pizza. The second thing people go crazy for here is the pastrami. Not surprising to find a place in Austin putting out near perfect pastrami. This is Austin after all and Austin smokes more high grade meats than Snoop Dogg smokes high grade trees. The pastrami platter comes with your choice of fatty / lean / or both. The meat gets placed in the middle of a plate and is surrounded with two types of mustard, bread, pickles, and onion. This pastrami was as good as any I've come across. I wish we had something like it in Chicago. Then there's the pizza which is certified by the Verace Pizza Napoletana (VPN) commission. It's one of only two spots in Texas to hold such a label. The certificate certifies that the pizza at Pieous is made in accordance with the high standards required of traditional pizza-makers in Naples. No idea how this compares to the pizza there but compared to the wood fired pies I've eaten here in the States this is as good as any. Pictured is a housemade Italian Sausage with Caramelized Onions that I've been back for. Pizza and Pastrami might be an odd pair but who cares when each of them is a top shelf product. I'd put this place on any best restaurant in Austin list. Worth ride from downtown. There's tons of Tex-Mex spots on my to-try list and even though I had been to Juan in a Million before, it was only to try the breakfast tacos. The tacos are fine but not my favorite. This trip in I finally got to try the famous 'Con Queso' breakfast plate. It's been a customer favorite for a long time now. Juan in a Million is in it's 37th year of business and on my visit it seemed as though everyone was a regular. The looks and feel of this place are about as old school Austin as it gets these days. Same goes for the famous breakfast plate that includes two eggs served any style with queso, carne guisada, refried beans, potatoes and flour tortillas. It might not be the prettiest plate of food but I cant imagine there being a breakfast that's more Texas than this. I'm lucky I don't live near there. Now that I've basically crossed off every Austin BBQ spot worthy of a visit I've started to explore the city's Tex-Mex scene. Readers might remember I'm actually a big fan of Tex-Mex and I say this as someone whos favorite cuisine is Mexican food. So trust me when I say I know the difference in the two and that one is not the other but rather an extension of it. My favorite way to enjoy Tex-Mex is via enchiladas. One of my favorite plates of food from any cuisine is a pool of red chile gravy with enchiladas swimming in them below a blanket of cheese and onions. To me it's the quintessential Tex-Mex dish. It's got everything going on that fans of Tex-Mex love and for that matter the same things that detractors of Tex-Mex hate. One of the best places in Austin to find a plate made in this way is the appropriately named Enchiladas Y Mas. Get the beef ranchero and be ready to go to war. Here we have another real deal Tex-Mex type spot. This one located in a strip mall and ran by what seemed like one big family. How many casual places do you find where the manager is there greeting every patron upon their entry. In this case he was doing so in the most Texas outfit possible and thus this place felt about as Texas as it can get. I think I found them through the search for the city's best carne guisada which is one of the many unofficial state foods of Texas. It's slow cooked chunks beef that's seasoned well and cooked until tender. One of the most popular ways to eat it is in between a flour tortilla. It really is a taco that more places outside of Texas should make as it's seasoned so well during the cooking process all it really needs is a tortilla to hold it. Casa Maria makes a good blend. When ordering the tacos I glanced at the menu and came across a lunchtime special consisting of beef enchiladas. They sounded good and I returned for them the following day. My hunch was right. These were more so the Mexican-American red sauce style than the Tex-Mex chile gravy kind but they were still satisfying. Casa Maria came across as the type of place I would frequent. This spot is a new school Tex-Mex joint tucked away in a residential part of town. It lives up to the old school Tex=Mex restuarant billing of having a huge space as there's a big bar, and large indoor and outdoor dining spaces. The menu was talking to me and that's because the enchiladas on offer. They had a nice selection of options and I wanted to try their take on the ranchero kind. Not my style. These were missing a few things including onions on top. But the sauce just wasn't the type I like. Really no flavor of chile at all, just tomatoes while the processed cheese wasn't working with the rest of it like it usually does. Labeled the 'truckers enchiladas' this plate was a bit of a let down. Enchiladas in a bowling alley? Dart Bowl is an old school 32 lane bowling alley and it's cafe is known for having fantastic enchiladas. According to Austinites this place is more than a bowling alley. It's a sneak peak back to old Austin and a time before Texas Cowboys were replaced with Brooklyn transplants. Both the bowling alley and the cafe are virtually unchanged since at least the 80's. Word on the web is you need to order your enchiladas inside the cafe and not at the takeout window in order to ensure they aren't made in a microwave. No idea if that's true but I didn't want to find out. I dont think this plate that fits my description of a perfect plate of enchiladas ever saw a microwave but if it did, well I always thought enchiladas reheated well. Texas Forever. The wife was feeling tired one night and decided to watch a movie with her friend so I decided to go get a drink. I chose Curra's because I was intrigued by their signature avocado margarita. That and the carne guisada enchiladas sounded pretty good to me. Curra's is a local spot with people from all walks of life dining in on my visit. The namesake enchiladas are rolled with cheese and then topped with carne guisada and more cheese served in between rice and beans. Not bad at all. While I still prefer the traditional red chile gravy variety this plate was a pleaser. Tex-Mex is good comfort food. This generically named trailer is part of Austin's current Honduran boom. As the country of Honduras continues to be unstable many of it's people are fleeing for America. 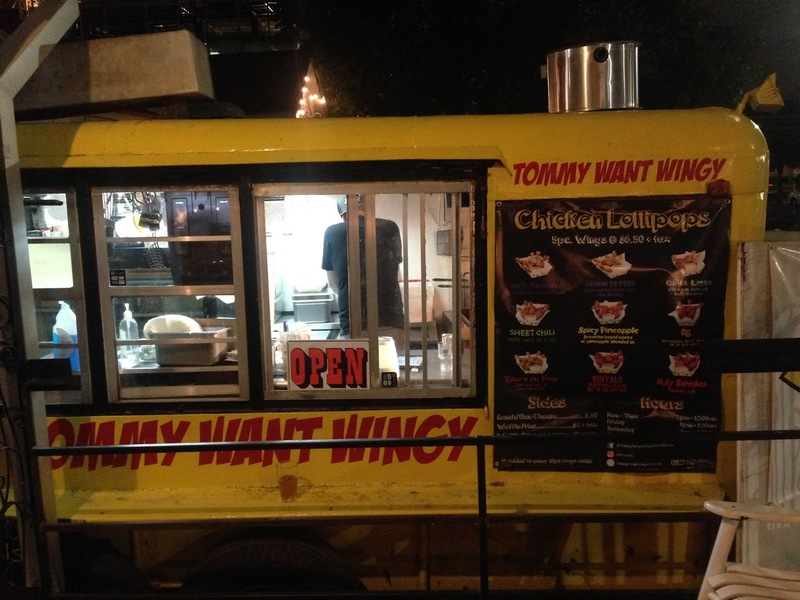 Austin seems to have gotten a large group and many of them are getting by through the city's love for food carts. Most all of the Honduran food one will find in Austin comes from the carts and most all of the carts are in parts of town that tourists, or transplants for that matter, rarely make it to. So to the best of my knowledge these carts are being frequented by mostly Hondurans themselves. The folks that want a taste of home where they eat baleadas aka burritos for breakfast. In a city where they love their breakfast served in a tortilla this little cart is more than capable of hanging with the big boys. Here's another Honduran food truck I found parked on the side of a gas station. As good as the Honduran baleadas are I am not as fond of Honduran style tacos. I've had a few offerings from a few different trucks and while I liked the ones from a previous post just fine I did not care much for these pictured below. It's just something about the cheese. Not sure if it's Parmesan or just Parmesan like but it's to overpowering of everything else. This "taco" was basically a loaded tostada. I spied this place somewhere online and the name caught my eye. I love ham for breakfast and also love tacos for breakfast. Seems like a spot I'd like. Though when visiting I didn't have the appetite I usually have so all I could go in on were a couple tacos as I passed on the signature house sandwich made with their honey ham. The place was packed with young people and families with young people as it's obviously a locals spot considering it's residential location hidden in the middle of a strip mall. The tacos were pretty damn good, specifically the ham, egg, and cheese. I'd go back. Here we have a place that fits the literal description of a "hole in the wall" as it's a walk up window located inside a small strip mall. I heard good things about the tacos from here and wanted to see what that talk was about. Well that talk was real. This remains the best carne guisada taco I've had the pleasure of trying. I'm playing around with my own recipe and this place with it's Nola style roast beef and gravy consistency matched with the flavors of Tex-Mex (cumin) is the place I'm most trying to mimic. 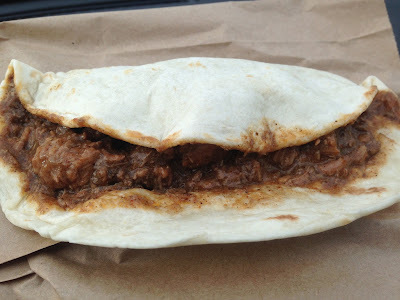 A good carne guisada taco needs nothing except the stewed beef and a tortilla to fill it in. I read good things about this trailer in a gas station in yet another residential part of town. What caught my eye was the fact they were making flour tortillas by hand, in the truck, upon ordering and that's what happened. I had one of the better breakfast tacos I've had from here in the form of a Migas taco. For those unfamiliar the Migas taco is every bit as part of a Texan's diet as smoked brisket is. Made with eggs, tomatoes, jalapenos, and little crispy strips of corn tortilla it's popular with cheese though some like theirs without it. It's a quintessential Texas breakfast and Mi Trailita makes a mean one. Though I did hear from an actual expert that the tortillas were gummy on his visit. But not mine. Quite a few people eating and taking food to go from this trailer on my visit. This is always a good sign as is handmade tortillas. Word on the block was that the Puerco Guisado was just like grandma used to make. So I went ahead and got us some of them. Not bad at all. Lots of chile up in there and plenty of fresh cilantro to coll it all down. The tortillas are made on site but not that powerful. 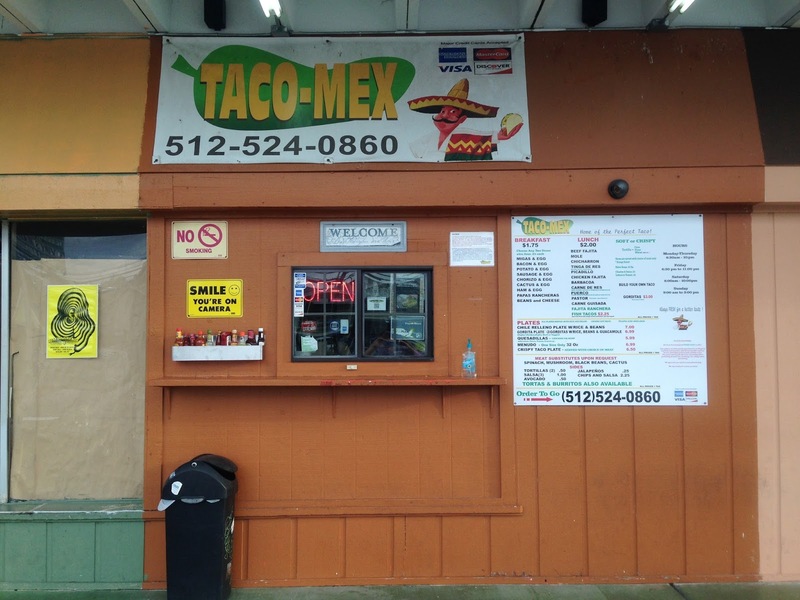 I got a list of taco trucks in Austin and when near one of the spots on that list I like to cross them off by stopping by. This trailer is liked by many and you can now add me to that list. The taco menu has a nice selection of options including a Taco Alambre which is one of my favorites. An alambre taco consists of steak mixed with something both porky and salty which in most cases is bacon. It's mixed with bell peppers and sometimes onions and also lots of melted cheese that stretches when taking a bite of the taco hence the name alambres which means wires in Spanish. Taqueria Morales makes a pretty near flawless version of a taco alambre with lots of crispy bits of meat mixed in. The best taco of this trip came from this little taco trailer named after the street it sits on. Capital Taco shares a lot with a few other food trucks including Brown's BBQ. Since Brown's is one of my favorite stops in all of Austin I knew that the brisket taco at Capitol would be the real deal and it was. They use the brisket made by the Brown's team and stuff a corn tortilla with it. Add on some pickled jalapenos and a fresh slice of avocado and some cheese and you got a fantastic Tex-Mex taco. The brisket in Austin is 2nd to none and Brown's makes some of the best. Lollipop Wings are a thing for me. I love them. So when I saw this new (to me) food trailer that was specializing in them what do you think I did? Tommy Want Wingy (an ode to Chris Farley's Tommy Boy) has a couple handfuls of options as far as sauce. I went with the Sweet Chile and liked them a whole lot. This particular trailer is on the outside patio of a bar on Rainey street which is a popular drinking area with lots of other food trailers scattered about the block. Good pub grub for sure. Here was the place where I enjoyed my last meal as a free man. Paperboy is one of Austin's most hyped trailers and it seemed like a good place to get some grub in me before taking the dive. As to be expected it was busy and my steak chilaquiles took longer than I had anticipated. This gave me plenty of time to thick about what was coming and whether or not I made a major mistake. Haha just kidding I never would've had this great relationship with Austin if not for the wifey. Paperboy is popular for it's breakfast plates with a bit of Texas Flair. The menu is small but all of it sounds good including the steak chilaquiles which also tasted good. The perfect fuel for what was ahead. Here we have a little piece of Nola chilling in Austin. Considering my love for a good New Orleans style SnoBall I had no choice but to stop. The place feels more like Nola than it tastes but I'll always enjoy a frozen treat in the heat. Its also possible I didn't choose well as far as flavors. We stopped into this well liked steakhouse for a bite during happy hour and sat at the bar so I could enjoy the burger. Well I enjoyed it so much i never even bothered to take a snap of it. So instead I'll lead over to the review that put it on my radar. Mike's a much better writer than me and he's probably the foremost authority on food in Austin even with his new job taking him to San Antonio. Check out his review of the burger at Jacoby's HERE. This place sources beef from their family ranch and has a small but focused menu when it comes to that. An order of Hush puppies is a good way to start. Alcomar remains a pretty good place to indulge in Happy Hour. Pretty sure they offer it daily and discounts are given on both food and drinks. I like the frozen margaritas they have on tap with the house special being my favorite.It's spicy but still extra refreshing. On a recent visit during our wedding week we indulged in a plate of cornmeal dusted shrimps, and oysters with pickled vegetables that clicked. I love the brightness inside of the inside and always feel at ease here. When riding around Austin you'll come across quite a few P. Terry's locations. The local chains are easily visible due to their large neon signs announcing their presence. This Austin based burger chain is popular for a quick drive thru meal and as a spot to grab a late nite snack. I found myself here a few times during my wedding week. It started when my dad asked me to pick him and my uncle up something to eat and he suggested a quick burger would do the trick. I got burgers for us and ended up liking P. Terry's and went back a couple times after that. Nothing fancy but these are much better than your typical fast food outlet despite being priced in the same range. Dare I say better than the In and Out's around town too.Just my opinion though. not big on I&O. Seems like pretty much every fusion possible has been combined these days. But that doesn't mean my fusion food loving self has gotten to try them all. When I found out about Nasha the combination of Indian and Tex-Mex really caught my attention. I never thought to put them together but when you think about it the cuisines have some similar traits and ingredients that work with each others. Take for example their enchiladas which come with your choice of meat (go for the goat) which is wrapped in tortillas and covered in masala sauce and a dollop of guacamole. I liked this place for what it was which seemed like a perfect representation of Austin and it's food scene. See ya next time.